(Francisco Kjolseth | The Salt Lake Tribune) Over 300 demonstrators fill the Capitol rotunda on Monday, Jan, 28, 2019, on the first day of the Legislative session to rally in support of protecting Proposition 3, the Medicaid Expansion law recently passed by voters. (Francisco Kjolseth | The Salt Lake Tribune) Kathy Adams joins over 300 demonstrators in the Capitol rotunda on Monday, Jan, 28, 2019, on the first day of the Legislative session to rally in support of protecting Proposition 3, the Medicaid Expansion law recently passed by voters. (Francisco Kjolseth | The Salt Lake Tribune) Eric Wilson expresses his sentiments as he joins over 300 demonstrators in the Capitol rotunda on Monday, Jan, 28, 2019, on the first day of the Legislative session to rally in support of protecting Proposition 3, the Medicaid Expansion law recently passed by voters. (Francisco Kjolseth | The Salt Lake Tribune) Over 300 demonstrators fill the Capitol rotunda on Monday, Jan, 28, 2019, on the first day of the Legislative session to rally in support of protecting Proposition 3, the Medicaid Expansion law recently passed by voters. 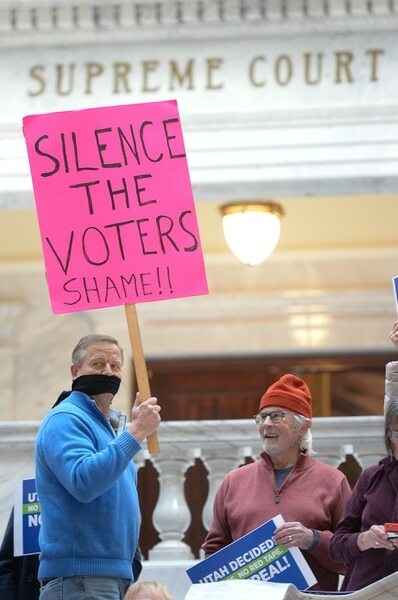 (Francisco Kjolseth | The Salt Lake Tribune) Robert Walton joins the fight in the Capitol rotunda on Monday, Jan, 28, 2019, on the first day of the Legislative session to rally in support of protecting Proposition 3, the Medicaid Expansion law recently passed by voters. (Francisco Kjolseth | The Salt Lake Tribune) Tiffany Malo, Pam Harrison and John Armstrong, from left, join over 300 demonstrators as they fill the Capitol rotunda on Monday, Jan, 28, 2019, on the first day of the Legislative session to rally in support of protecting Proposition 3, the Medicaid Expansion law recently passed by voters. (Francisco Kjolseth | The Salt Lake Tribune) Over 300 demonstrators fill the Capitol rotunda on Monday, Jan, 28, 2019, on the first day of the Legislative session to rally in support of protecting Proposition 3, the Medicaid Expansion law recently passed by voters. (Francisco Kjolseth | The Salt Lake Tribune) Newly elected Sen. Derek Kitchen, D-Salt Lake, shows his support for the demonstrators gathered in the Capitol rotunda on Monday, Jan, 28, 2019, on the first day of the Legislative session to rally in support of protecting Proposition 3, the Medicaid Expansion law recently passed by voters. (Francisco Kjolseth | The Salt Lake Tribune) Eric Wilson expresses his sentiments as he joins over 300 demonstrators in the Capitol rotunda on Monday, Jan, 28, 2019, on the first day of the Legislative session to rally in support of protecting Proposition 3, the Medicaid Expansion law recently passed by voters. (Francisco Kjolseth | The Salt Lake Tribune) Stacy Stanford, policy analyst at Utah Health Policy Project who was formerly in the coverage gap rallies the crowd of demonstrators filling the Capitol rotunda on Monday, Jan, 28, 2019, on the first day of the Legislative session to rally in support of protecting Proposition 3, the Medicaid Expansion law recently passed by voters. (Francisco Kjolseth | The Salt Lake Tribune) Christie Sorensen, a cancer survivor who was saved by medicaid gives an impassioned account of her story as over 300 demonstrators fill the Capitol rotunda on Monday, Jan, 28, 2019, on the first day of the Legislative session to rally in support of protecting Proposition 3, the Medicaid Expansion law recently passed by voters. (Francisco Kjolseth | The Salt Lake Tribune) Gaylynn Bennion holds Ashlynn, 20-months, at the Capitol rotunda on Monday, Jan, 28, 2019, on the first day of the Legislative session to rally in support of protecting Proposition 3, the Medicaid Expansion law recently passed by voters. (Francisco Kjolseth | The Salt Lake Tribune) Katrina Andelin Brown joins over 300 demonstrators as they fill the Capitol rotunda on Monday, Jan, 28, 2019, on the first day of the Legislative session to rally in support of protecting Proposition 3, the Medicaid Expansion law recently passed by voters. (Francisco Kjolseth | The Salt Lake Tribune) Alan Ormsby, State Director of the AARP encourages people to contact their representatives as over 300 demonstrators fill the Capitol rotunda on Monday, Jan, 28, 2019, on the first day of the Legislative session to rally in support of protecting Proposition 3, the Medicaid Expansion law recently passed by voters. (Francisco Kjolseth | The Salt Lake Tribune) Rep. Brian King, D-Salt Lake, left, and Rep. Joe Briscoe, D-Salt Lake, give the thumbs up to demonstrators gathered at the Capitol rotunda on Monday, Jan, 28, 2019, on the first day of the Legislative session to rally in support of protecting Proposition 3, the Medicaid Expansion law recently passed by voters. (Francisco Kjolseth | The Salt Lake Tribune) Ma Black, Beth Armstrong and Bob Mayhew become emotional as they hear the words given by cancer survivor Christie Sorensen who says medicaid saved her life during a demonstration in the Capitol rotunda on Monday, Jan, 28, 2019, on the first day of the Legislative session to rally in support of protecting Proposition 3, the Medicaid Expansion law recently passed by voters. (Francisco Kjolseth | The Salt Lake Tribune) Over 300 demonstrators fill the Capitol rotunda on Monday, Jan, 28, 2019, on the first day of the Legislative session to rally in support of protecting Proposition 3, the Medicaid Expansion law recently passed by voters. (Francisco Kjolseth | The Salt Lake Tribune) Kids help to make signs in the Capitol rotunda on Monday, Jan, 28, 2019, on the first day of the Legislative session to rally in support of protecting Proposition 3, the Medicaid Expansion law recently passed by voters. (Francisco Kjolseth | The Salt Lake Tribune) Bishop Scott Hayashi, Episcopal bishop and original sponsor of the Prop 3 initiative takes to the podium on Monday, Jan, 28, 2019, in the Capitol rotunda on the first day of the Legislative session to rally in support of protecting Proposition 3, the Medicaid Expansion law recently passed by voters. (Francisco Kjolseth | The Salt Lake Tribune) Wendy Davis joins the demonstration in the Capitol rotunda on Monday, Jan, 28, 2019, on the first day of the Legislative session to rally in support of protecting Proposition 3, the Medicaid Expansion law recently passed by voters. (Francisco Kjolseth | The Salt Lake Tribune) A group faces the House chambers at the Utah Capitolon Monday, Jan, 28, 2019, on the first day of the Legislative session to rally in support of protecting Proposition 3, the Medicaid Expansion law recently passed by voters. (Francisco Kjolseth | The Salt Lake Tribune) Over 300 demonstrators fill the Capitol rotunda on Monday, Jan, 28, 2019, on the first day of the Legislative session to rally in support of protecting Proposition 3, the Medicaid Expansion law recently passed by voters. (Francisco Kjolseth | The Salt Lake Tribune) Over 300 demonstrators fill the Capitol rotunda on Monday, Jan, 28, 2019, on the first day of the Legislative session to rally in support of protecting Proposition 3, the Medicaid Expansion law recently passed by voters. Since Medicaid expansion became optional for states in 2012, the Rev. Scott Hayashi said Monday, poll after poll of Utahns showed support for closing the so-called coverage gap and providing health care to low-income residents. 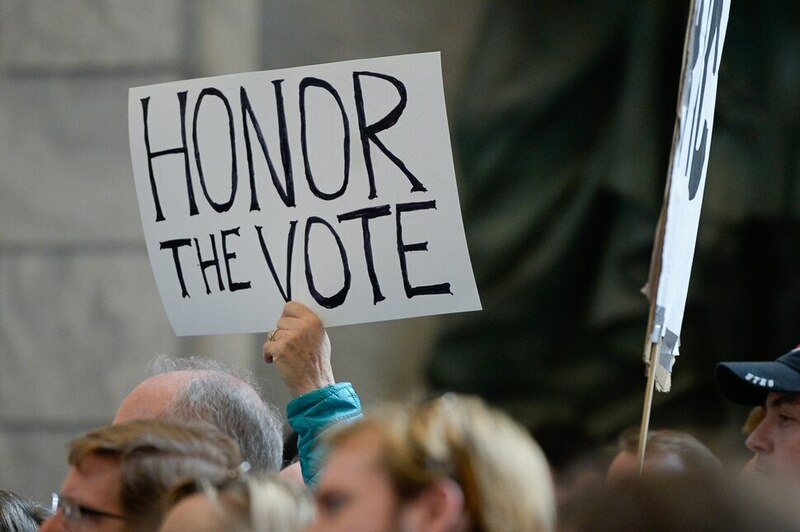 Hayashi, bishop of the Utah Episcopal Diocese, said the state Legislature repeatedly failed to represent their constituents on the issue, finally leading supporters to launch a successful ballot initiative, Proposition 3, to provide “conclusive evidence” to lawmakers. Hayashi was one of several speakers who addressed a crowd of roughly 300 at the state Capitol on Monday, the first day of the 2019 legislative session. His remarks, like those of the other speakers, were aimed at a pair of bills and ongoing closed-door discussions that seek to either repeal Utah’s Medicaid Expansion outright, or significantly alter it through some combination of delays, spending caps and enrollment restrictions. Legislative leaders on Monday emphasized their desire to respect the will of the voters — Prop 3 earned 53 percent of the statewide vote in November — while also expressing concern over the long-term cost of expansion. In the Senate, members of GOP leadership suggested that neither of the chamber’s two repeal bills — sponsored by Republican Sens. Jacob Anderegg of Lehi and Allen Christensen of North Ogden — had their endorsement, but that some modification of Prop 3 is likely during the 45-day session. "There’s probably something in the middle we settle on,” said Sen. Dan Hemmert, R-Orem, the Senate majority whip. House Speaker Brad Wilson, R-Kaysville, said by approving the tax increase built into Prop 3, Utah voters sent a clear message of support for narrowing the coverage gap. Wilson said there’s a “high probability” the state will be able to achieve full expansion by the April 1 deadline — when the initiative takes full, legal effect — although the details of the Legislature’s approach are still under discussion. Alan Ormsby, director of AARP Utah, said the inclusion of a tax increase in Prop 3 shows how serious Utah’s majority-conservative voters were about expanding Medicaid. Under Proposition 3, a sales tax increase initially generating roughly $90 million will be combined with $800 million in federal funding to provide health care coverage to 150,000 low-income Utahns, including those earning up to 138 percent of the federal poverty level. But estimates by the Governor’s Office of Management and Budget suggest the initiative’s revenue would fall $10.4 million short of the cost of Medicaid expansion by 2021, and $64.5 million short by 2024. Supporters dispute those figures, and argue that the election results show the public’s support for sustaining Medicaid expansion over time. And despite the debate over costs, both Gov. Gary Herbert and Wilson have proposed tax cuts of more than $200 million. Stacy Stanford, a policy analyst at the Utah Health Policy Project, said she personally experienced the health coverage gap — in which a person earns too much for traditional Medicaid but too little for subsidized health insurance — after getting sick and losing her job. Utah’s federal taxes are currently helping to pay for health care in other states, she said, and Medicaid expansion would bring that money back home to help people in need. 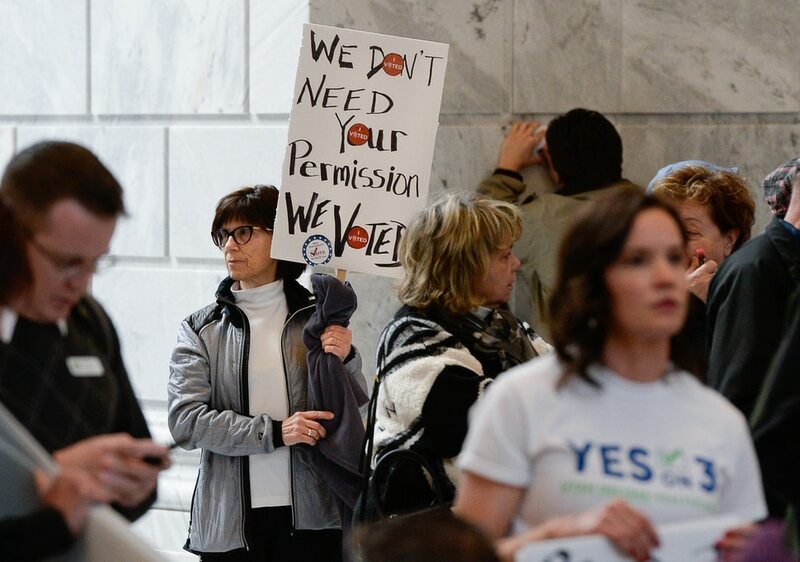 And unlike previous partial-expansion plans approved by the state Legislature or some of the proposed changes floated by lawmakers, she said, Utah can move forward on Proposition 3 without seeking waivers from the federal government. One attendee at the rally, Cottonwood Heights resident Frido Lyn Hicks, said a problem with government is that lawmakers forget they were elected to represent the views of their constituents. Tribune reporter Bethany Rodgers contributed to this report.